Androgyny was identified first by plato as a combination of the two sexes. His myth tell the story of three sexes; male, female, and male-female respectively from the sun, earth, and the moon. The synthesis of the two sexes gives the male and female characteristics of style, music, expression, sexual experience, and appearance in contemporary times. Popularized in the 80’s glam-pop music scene there was an explosion of what many deemed sexually ambiguous styles and expression. For this aesthetic is characterized no better than by Boy George British front man for Culture Club. Other glam-pop British front-men were Freddie Mercury from Queen and David Bowie. Both spent most of their lives in sexual ambiguity and developed personas around androgynous combinations of both male and female styles. All three were huge proponents to colonial white face powder with soft facial features like that of a 18th century woman. This in combination with flamboyant skintight clothing, all in contrast to very evident masculine features like Freddie’s chest left many to wonder and developed a spectacle. Before Bowie’s recent death, he had said he felt like the world’s first closeted heterosexual. 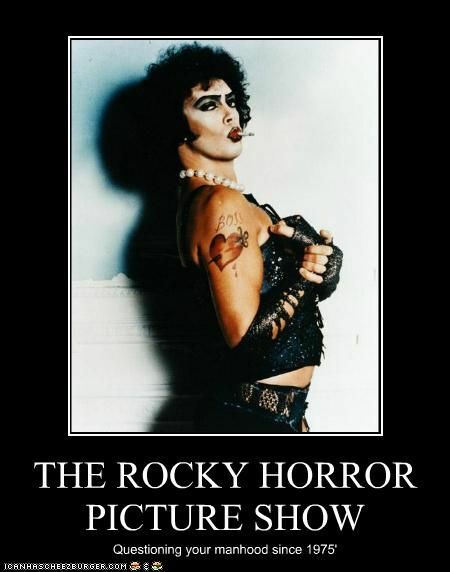 While the Rocky Horror Picture Show is explicit to identify Tim Curry as a transexual, there are parallels to the androgynous aesthetic of flamboyant celebration of both female and male expression. The whole movie has Tim Curry’s testosterone fueled figure running around in stockings and high heels all accentuated with a pearl necklace. I wonder if their goals were subversion of the gender binary people take so seriously, or simply a desire to remove boundaries to their expression.